Clerics gain a +2 class bonus to Wisdom or Strength, as long as it isn’t the same ability you increase with your +2 racial bonus. Possible backgrounds include: healer, archivist, military chaplain, temple guard, bartender, reformed thief, dwarven hierophant, initiate, and bishop. At 1st level, a cleric starts with a melee weapon, decent armor, a holy symbol, and other minor possessions suggested by their backgrounds. They might even have a crossbow. Clerics may start with either 25 gp or 1d6 x 10 gp. Although not listed on the table, this class gets three talents. It does not gain more at higher levels. All clerics have the Ritual Magic class feature. They also receive a bonus spell: heal. Cast for power and cast for broad effect: The spell can be used one of two ways—either as a more powerful effect on one target (power) or as a weaker effect on multiple targets (broad). Spells cast for power cannot target the caster. Spells cast for broad effect can. Free recovery: The cleric can recover hit points as if they were using a recovery (without actually spending the recovery). Heal using a recovery: The character targeted with a healing effect uses one of their recoveries and rolls their own recovery dice. Invocation: A quick action that offers advantages in battle. It can be made once a day. 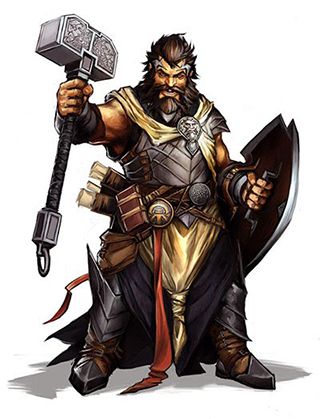 More than one cleric in a party cannot use the same invocation during a battle. Adventurer Feat The target can now be a nearby ally instead of an ally you are next to. Champion Feat If the target of your heal spell is an ally with 0 hp or below, that ally also adds hit points equal to 1d10 x your Charisma modifier to the recovery. Epic Feat When you cast heal on an ally you are next to, that ally adds +30 hp to the recovery. Choose three cleric talents/domains. Each talent/domain provides an ability that can be improved by feats. It also provides an invocation you can use as a quick action once per day, per battle, per party. Invocation of Healing: This battle, you gain an additional use of the heal spell (see Class Features, left). The first heal spell you cast after using this invocation allows the target to heal using a free recovery instead of spending a recovery. Champion Feat The invocation of healing gives you two additional uses of heal this battle instead of only one. Epic Feat Increase the additional hit points the target heals to triple your level. Once per turn when an enemy scores a critical hit against you or a nearby ally, or drops you or a nearby ally to 0 hp or below, you gain an attack-reroll blessing. Immediately choose a nearby ally and give them the blessing as a free action. An ally with this blessing can use it to reroll an attack as a free action this battle. An ally can only have one such blessing on them at a time. Adventurer Feat You can take the attack-reroll blessing yourself. Champion Feat When you gain an attack-reroll blessing to distribute, you gain two blessings to distribute instead. Epic Feat Attacks rolls from your reroll blessings gain a +4 bonus. You gain 4 additional background points that must be used somehow in relation to knowledge or lore. Invocation of Knowledge/Lore: You must use this invocation during your first round of a battle. When you do, you get a quick glimpse of the battle’s future. Roll a d6; as a free action at any point after the escalation die equals the number you rolled, you can allow one of your allies to reroll a single attack roll with a +2 bonus thanks to your vision of this future. Adventurer Feat Once per day, you can change one of your skill checks involving knowledge to a natural 20 instead. Interpret the word “knowledge” as loosely as your GM allows. GMs, be generous. Champion Feat You now roll a d4 for the invocation, not a d6. Epic Feat You gain a different positive relationship point each day with a random icon, purely because the icon has realized you know something they need to know. It changes every day and it might contradict your usual icon relationships. You and your nearby allies gain a +1 bonus to death saves. Invocation of Life/Death: This battle, you and each of your allies can each separately add the escalation die to a single save made by that character. In addition, you and your allies do not die from hit point damage when your negative hit points equal half your normal hit points. Instead, you die when your negative hit points equal your full hit points. Adventurer Feat The death save bonus increases to +2. Champion Feat Each battle, the first time an ally near you becomes staggered, that ally immediately heals hit points equal to twice your level. Epic Feat Your first use of the resurrection spell is free, and doesn’t count against your total. Once per level, you can generate a one-point conflicted relationship with a heroic or ambiguous icon you do not already have a relationship with. The relationship point remains with you until you gain a level, and then it’s time for another one-level relationship. Champion Feat You gain two points in the relationship instead. Invocation of Love/Beauty: As a free action, at some dramatic moment, you or an ally of your choice can roll for one icon relationship that might have an effect on the battle. Rolls of 5 and 6 are beneficial as usual, though the GM will have to improvise what that means in the middle of combat. The invocation’s advantage does not occur the moment you roll initiative; wait for a dramatic moment instead. Once per battle, you can affect two additional allies when you cast a spell for broad effect. Adventurer Feat Whenever you target one or more allies with a spell, one ally of your choice can roll a save against a save ends effect. Invocation of Protection/Community: This battle, critical hits against you and your nearby allies deal normal damage instead of critical damage. Adventurer Feat Once per battle, you can deal extra damage to one target you hit with a melee attack as a free action. The damage bonus is a number of d4 equal to your Strength modifier or to your level, whichever is higher. Champion Feat You can use d8s instead of d4s for the bonus damage dice. Epic Feat Once per day, you can use d20s instead of d8s for the bonus damage dice. Invocation of Strength: This battle, you and your nearby allies deal triple damage instead of double damage on critical hits with melee attacks. Every attack you make deals holy damage instead of other types of damage unless you choose otherwise for a specific attack. Adventurer Feat If your attack already deals holy damage, it gains the following bonus damage—adventurer tier: +1 damage; champion tier: +2 damage; epic tier: +3 damage. Champion Feat You gain a +2 bonus to all defenses against attacks by undead. Epic Feat The invocation also affects your allies’ daily spells. Invocation of Sun/Anti-Undead: When you cast a daily cleric spell this battle, roll a d6. If you roll less than or equal to the escalation die, you regain the use of that daily spell after the battle. Once per battle, as a quick action when you are engaged with an enemy, roll a d20 (your ‘trick die’). As a free action before the start of your next turn, give your trick die to a nearby ally or enemy who is about to make an attack roll. The trick die result becomes the natural result of their roll instead. Champion Feat Your trick die can be used for any one d20 roll, not just an attack. Epic Feat You get another trick die roll to use each battle the first time the escalation die reaches 3+. Invocation of Trickery/Illusion: This battle, attacks against you by enemies that moved to engage you during their turn miss on natural odd rolls. Once per turn when you make a melee attack against an enemy, hit or miss, your allies gain a +1 attack bonus against that enemy until the start of your next turn. Adventurer Feat The attack no longer has to be a melee attack, close and ranged attacks also work. Champion Feat The bonus now applies against all enemies you attack; you no longer have to single out one foe if you use a spell that attacks multiple enemies. Epic Feat Allies now also get a damage bonus against such enemies equal to double your Charisma modifier. Invocation of War/Leadership: Increase the escalation die by 1. Cast for power: One nearby ally gains a +2 attack bonus until the end of the battle. Cast for broad Effect: Choose up to three nearby creatures (including you); each target gains a +1 attack bonus until the end of the battle. 3rd level spell: Each target also gains 1d10 temporary hit points per point of the attack bonus. 5th level spell: Each target also gains 2d10 temporary hit points instead of 1d10 per point of the attack bonus. 7th level spell: All attack bonuses granted by the spell increase by +1. 9th level spell: Each target also gains 3d10 temporary hit points instead of 2d10 per point of the attack bonus. 3rd level spell: The target can also roll a save against each save ends effect. 5th level spell: This spell is now recharge 16+ after battle instead of daily. 7th level spell: The target can heal using two free recoveries instead of one. 9th level spell: This spell is now recharge 11+ instead. 3rd level spell: The spell now requires only a quick action to cast. 5th level spell: You deal half damage on misses with basic melee attacks this battle. 7th level spell: Once during the battle, you can reroll a basic melee attack. 9th level spell: For the rest of the battle, change any of your basic melee attack damage dice rolls that are less than the escalation die to the escalation die value. 3rd level spell: 3d6 damage. 5th level spell: 6d6 damage. 9th level spell: 8d10 damage. Adventurer Feat The spell also deals +1d6 damage against an undamaged target. At 5th level that increases to +2d6 damage; at 8th level it increases to +4d6 damage. Champion Feat You can now target a far away enemy with the spell at a –2 attack penalty. Epic Feat If your natural attack roll is an 18+, make the attack a second time against a different target as a free action. Cast for power: One nearby ally gains a +2 bonus to AC this battle. Cast for broad Effect: Choose up to three nearby creatures (including you); each target gains a +1 bonus to AC this battle. 3rd level spell: The bonus also applies to PD. 5th level spell: The bonus increases by +1 while the target is staggered. 7th level spell: The bonus also applies to MD. 9th level spell: The bonus when cast for power increases to +4. The bonus when cast for broad effect increases to +2. 3rd level spell: 7d6 damage. Champion Feat You also gain the bonus to AC until the end of your next turn on a hit. Hit by 8+: Against non-mooks, holy damage equal to half the target’s maximum hit points, and the target is dazed (save ends). Against mooks, the +8 result now deals 4d10 x your level holy damage. 3rd level spell: Target with 90 hp or fewer. 5th level spell: Target with 150 hp or fewer. 7th level spell: Target with 240 hp or fewer. Adventurer Feat You can expend your daily use of turn undead to gain an additional use of heal in one battle. Champion Feat You can choose to target either demons or undead with the spell (but not both with the same casting). Epic Feat Increase the targeting limit by 100 hp. Miss: The target hates you for having tried to scare it, and it wants to hurt you most of all, but it won’t be any stupider than usual in pursuing that goal. 5th level spell: Target with 120 hp or fewer. 7th level spell: Target with 190 hp or fewer. 9th level spell: Target with 300 hp or fewer. Effect: Make a basic melee attack. If the attack hits, you or one conscious nearby ally can roll a save against a save ends effect. 5th level spell: The save gains a +1 bonus. 7th level spell: If the attack hits, you and your nearby conscious allies can roll a total of two saves (one per character). 9th level spell: The save bonus increases to +2. Adventurer Feat If you score a critical hit with the combat boon attack, the subsequent save automatically succeeds. Champion Feat One nearby conscious ally can roll a save even if your attack misses. Cast for power: One nearby ally gains 40 temporary hit points. Cast for broad Effect: Choose up to three nearby creatures (including you); each target gains 20 temporary hit points. 5th level spell: Temporary hp = 60/30. 7th level spell: Temporary hp = 80/40. 9th level spell: Temporary hp = 100/50. Champion Feat The spell now deals half damage on a miss. Epic Feat The spell is now recharge 16+ after battle instead of daily. Cast for power: One nearby ally can heal using a single recovery and regain double the usual number of hit points. Cast for broad Effect: Choose up to three nearby creatures (including you); each target can heal using a recovery. 5th level spell: The spell can now target far away allies. 7th level spell: Power equals triple the usual hp for one recovery; broad equals 150% the usual hp per recovery. 9th level spell: Recoveries provided by the spell are now free. Champion Feat This spell is now a close-quarters spell. 5th level spell: Power +4d6, Broad +2d6. 7th level spell: Power +4d10, Broad +2d10. 9th level spell: Power +6d10, Broad +3d10. Effect: For the rest of this battle, all enemies near you with 100 hp or fewer take a penalty to their Mental Defense equal to your Charisma modifier. Whenever one of those enemies misses with an attack roll, it takes holy damage equal to double your level. 7th level spell: 160 hp or fewer. 9th level spell: 250 hp or fewer. Effect: Choose yourself or a nearby ally. Enemies with 100 hp or fewer cannot attack the chosen target until that creature attacks or the escalation die reaches 6+. Effect: You or one nearby ally can heal using a free recovery. Then make the following attack. Hit: 7d8 + Charisma holy damage. 7th level spell: 8d12 damage. Effect: Choose a defense: AC, PD, or MD. For the rest of the battle while you are conscious, you and each ally near you gains a +1 bonus to that defense. Each enemy that misses you or one of your nearby allies with an attack against the defense you chose is hampered until the end of its next turn. 9th level spell: Attacks against the chosen defense cannot score critical hits. Epic Feat The spell is now (recharge 16+) after battle instead of daily. Ranged spell; Special: You can cast this spell only once per level, and a limited number of times in your life. You must have most of the corpse available to cast the spell. There’s no time limit on resurrecting a dead PC, so long as you have the corpse. Effect: You can bring a creature back to life in more or less normal condition, with varying levels of recovery. Limited Casting: The first time in your life that you use the spell, you can cast it with a single standard action. Using the spell removes one of your spell slots until you gain a level. (You get one less spell per full heal-up.) The person you are resurrecting comes back at roughly half strength, e.g. expending half their recoveries, being dazed (save ends), and, for each ability, having a 50% chance that it is expended. The second time in your life you cast the spell, it takes at least three or four rounds and costs you roughly half your hit points and daily powers/spells. The person you are resurrecting comes back at something like one-quarter strength. The third time you cast the spell it has to be as a ritual. The spell chews you up and leaves you with only a few hit points, then gnaws at the person you have resurrected, who takes days to recover well enough to qualify as an adventurer or combatant. The fourth time you cast the spell it nearly kills you. The resurrection succeeds but the person you’ve resurrected is going to be a mess for a month or more, regardless of any other magic you use. The fifth time you resurrect someone, that’s the end of your story and you die. There’s only a 50% chance that the resurrection spell works on the target. You’ve used up your quota of resurrection magic. You’re not coming back via this spell, either. Limited Resurrection: If the target of your resurrection spell has been resurrected more times than you have cast the spell, there is a 50% chance that the experience will play out using their higher number of resurrections instead of the number of times you have cast the spell. 9th level spell: You no longer need to have most of the corpse to perform this spell. Special: You must cast this spell outdoors. It enables you and a group of nearby allies to travel to most any location in the world that you can name. Travel takes between an hour and a day, depending on distance and the amount of effort the exerted. The destination can be in the overworld or in the land. It can’t be in the underworld. Effect: You utter a powerful prayer upon your comrades, giving each a special blessing. At any point later this battle, each blessed ally can acknowledge the blessing by saying ‘thank you’ to your god, gods, or pantheon as a free action to reroll a d20 roll. That ally must take the reroll result. Note that you are giving the blessing and don’t receive it yourself. Epic Feat This spell is now a quick action to cast.